Inland Empire – Business Growth in the Inland Empire outpaced the nation during the fourth quarter of 2017. The UCR School of Business, Center for Economic Forecasting and Development (Center) reported the inland region grew at an annualized rate of 3 percent—the nation’s economy, on the other hand, only grew by 2.3 percent last year. There was also good news in regard to the area’s growth year-over-year. By this measure, the Inland Empire’s business activity grew by 3.5 percent from the fourth quarter 2016, to the fourth quarter of 2017. This too was faster than the growth rate for U.S. Gross Domestic Product (GDP), where year-over-year growth stood at 2.5 percent. 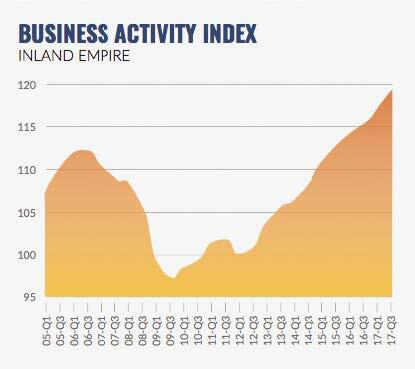 The Center further noted although the region’s overall outlook for business activity remains positive, it cautioned that over time, slower growth in the labor force will begin to constrain the area’s economic output. Kleinhenz reinforced projections regarding continued expected growth throughout 2018 and reinforced caution regarding how the area’s pace of expansion “will depend on the extent to which its labor force increases.” He further noted because the region’s labor force growth accelerated late in the year in 2017, he considered it a good sign for 2018. Among other good news highlighted in the report was the Inland Empire produced the fastest growing economy in California in 2017, in the area of job growth. Nonfarm employment in the region grew by 3.0 percent in 2017, compared to 1.8 percent in the state overall. See the full report online at https://ucreconomicforecast.org/wp-content/uploads/2018/02/Business-Activity-Index-4th-Quarter-2017.pdf.